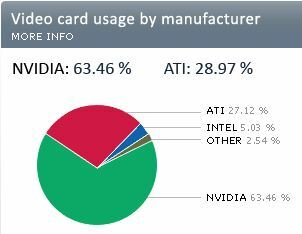 NVIDIA leads the market with 63.46% and ATI captures 28.97%. In the field of OS, Windows XP 32-bit is the most popular (47.97%), followed by Windows Vista 32-bit (20.98%) and Windows 7 64-bit (13.16%). 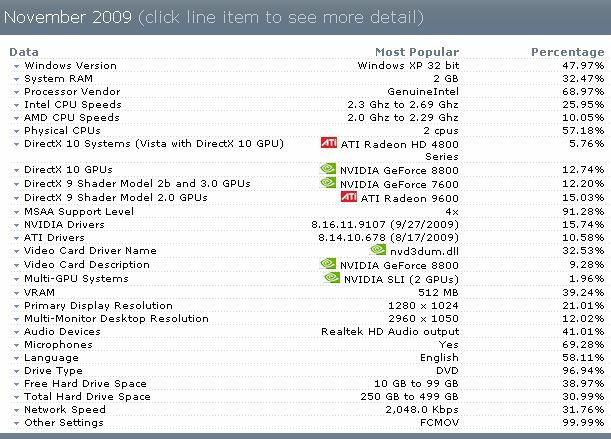 It’s interesting to see that the most used NVIDIA drivers is the Forceware 191.07 (OpenGL 3.2) with more than 15%. You’re ignoring the fact that Windows XP usage is on the decline. It’s been losing ground for months now. For the first time ever since Steam began, Windows XP has dropped below 50% usage. Windows 7 uptake has been accelerating on Steam and has reached 20%. The Steam December Survey should be out in a few more days, and I expect Windows XP and Vista to drop more and Windows 7 to increase more. 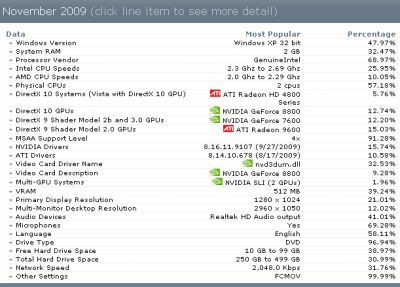 I have kept track of the Steam stats in regards to Windows versions since September/2009, so I can back up my claims. Of course 64-bit operating systems use more RAM, as memory pointers eat up 64-bits instead of 32-bits, so you’ve got to use more RAM to store them. It also has pretty damn good compatibility, I can run all of my games on Steam just fine. And as far as speed is concerned, you’re offmark, I actually notice on average a 5% FPS increase in my games on Steam in Windows 7 x64 over Windows 7 x86 on the same hardware. Also note that RAM usage cannot be equated with performance. For example, searching using a hash table uses up far more memory than a simple array, but it’s magnitudes faster. 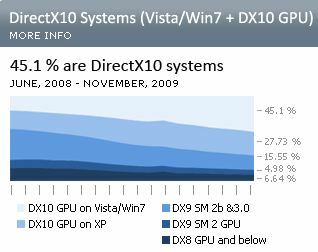 Where Windows 7 x64 is going to be slower is on older hardware. If you don’t have at least 3GB of RAM, or you’re on an older single-core CPU, Windows 7 x64 is naturally going to be less performant. If you have 3GB or more of RAM, and a dual or quad core CPU, you should actually notice a slight speed increase. The reason being is that x86-64 CPUs in 64-bit mode have twice the number of general purpose registers than do x86 CPUs in 32-bit mode, and aren’t hitting the L1 cache as much to fetch data. The December 2009 stats are now out. It appears I was correct. Windows XP 32-bit has dropped another 5.24% since the beginning of December. We saw a small shift over to Windows XP 64-bit, but it’s insignificant (0.13% increase). Windows 7 is picking up all of the slack. The death of Windows XP is accelerating month by month. Wine reports itself as Windows XP 32-bit. There’s no way for Steam games to be able to tell they’re running on Wine. If Wine didn’t report itself as Windows XP 32-bit, it would break a lot of software that the Wine project supports. I know all that J but it would still be interesting to find out.